Preparations are underway for the 2019 Long-Service Awards and Retiree Recognition Ceremony being held on May 1, 2019, in the Student Union Ballrooms starting at 1:00 p.m. All employees are invited to attend the ceremony. The Awards Ceremony is to recognize service for AUPE, APO & Faculty members. For more information on your Long-Service calculation click "Read More". Running Wednesdays this semester from March 6 - April 24 REGISTER TODAY! Bring your lunch and join us for a Lunch & Learn session on Snake Safety, presented by Friends of the Helen Schuler Nature Centre Society and guest speaker, Ken Moore. The 2019 Long Service Awards are to be held on Wednesday, May 1st, 2019 in the Student Union Ballrooms starting at 1:00 PM. The Awards Ceremony is to recognize service for AUPE, APO and Faculty members. If you would like us to check into whether you have service that meets the new criteria, please contact Susan at susan.roth@uleth.ca by January 2, 2019. We will be happy to check our records and get back to you. Bring your lunch and join Ken Moore, from the Friends of Helen Schuler Nature Centre Society, and U of L Alumnus, as he talks about our co-existance with the local rattlesnakes. Dr. John Zavier Pereira, President of the Pain Society of Alberta will be presenting this year's Connecting with Chronic Pain session. Please phone Jess at 403-388-6244 to register as space is limited. Interested in trying out a sit/stand workstation? Contact Suzanne for more info. Here is the process for purchasing sit/stand workstations. Get ready for this year's Bee Heart Smart Physical Activity challenge! The Great-West Life Centre for Mental Health in the Workplace recently launched it's latest tool, Plan for Resilience. Check out their website for an overview of the resource and more guides. Mental Health and Wellness presentation for Academic Leaders. Feel free to take a look - you may find some new strategies to deal with your own mental wellness. Mindful Employer Sessions - Wellness will be contacting U of L departments to set up workshops in one of 4 areas: Accommodation, Resolving Conflict, Improving Workplace Relations, Responding to Mental Health Issues. 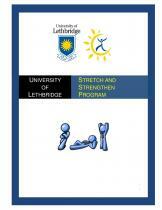 Watch for 1-hour sessions in your area, or contact wellness@uleth.ca for more info. The purpose of this program is to provide stretching and strengthening exercises that can be completed at your desk, out on the job, or even at home. The program is broken up into six sections. Use that break-down to manage your exercise time and target areas you want to develop. Remember the key here is balancing strength and flexibility in the important muscle groups and for the whole body. CLICK HERE to download the program. Follow along to a video demonstration HERE! For the full list with included resources and articles visit our Ways to Stay Well Page! 'Health Check for U' is Changing Lives! 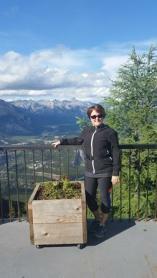 Read an article by U of L's Kori-Lee Nicolle about how Health Check for U helped her achieve her health goals. How do YOU Stay Well at the U of L? Do you have an interest you enjoy outside of work, something that helps stretch and maintain your physical and/or mental well-being? If so, we'd love to display it in our rotating 'Staying Well at the U of L' feature on our website. Take a photo of your talent, interest or yourself in action. You could display a quilt, or some wood-turning, a woven scarf, or a jar of jam. Use the online form to share your story and photo and we will display on a rotating basis on our website and other U of L wellness publications (monthly wellness newsletter, Wellness Facebook, Twitter). With the help of an independent survey company (Metrics@Work), Wellness & Recognition is planning the third Employee Health and Wellness survey. The goal is to capture trends, identify health and wellness programming and improve where possible. 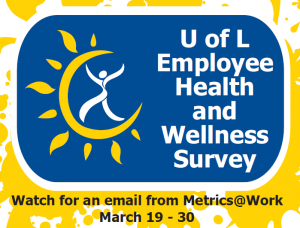 Watch for an email from Metrics@Work the week of March 19 and the survey will be open from March 19 - 30. Thank you to all who took the time to fill out the 2015 Employee Health & Wellness Survey. The goal was to capture trends, identify health and wellness programming and improve where possible. 574 employees (or 49.4%) responded and we have captured the results. The University of Lethbridge Employee Assistance Program is a confidential resource provided to help faculty, staff and family members (who are enrolled in the benefits plans) enhance their personal and workplace functioning. You and your eligible dependents can each receive up to twelve hours of counselling services per benefit year provided through the EFAP. Counselling services are provided either in person, over the phone or through a secure Internet site. Need more info? Click EFAP. Yes. The EFAP carefully adheres to professional standards of ethics and confidentiality. Records maintained by the EFAP are not part of or accessible to any other University record system. Except for danger to self or others, child or elder abuse or neglect, or authorized legal access, no information is released without consent of the client. What does it cost to use the EFAP? There is no cost to you for up to twelve, 1-hour long appointments with the EFAP. My supervisor (or spouse/co-worker) wants me to come for counselling. Do I have to? Use of the EFAP is voluntary. This said, if someone is suggesting the EFAP, they must be worried about you and it may be a good idea to talk with a professional. When you think about it, an hour with a trained professional who listens carefully to your concerns is a supportive event. Is it true that most people who come to the EFAP have alcohol or substance abuse issues? No, this is not true. 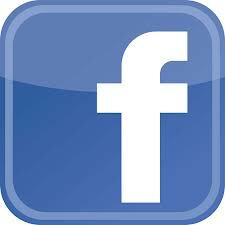 Most people who use the EFAP come to discuss relationship issues or personal development. People also come for help with managing anxiety or for assistance in adjusting to a new community.